The five straw spiral plait is the simplest of all the spiral plaits. Using a core helps to create an even plait. Once this plait has been mastered you can go on and do spiral plaits with seven or more straws. The technique will be the same for any spiral plait using any number of straws. The straw for spiral plaiting has to be one of the hollow stemmed varieties. Much of the wheat you see in fields is primarily used for feed and milling and so the long straw is not required. Specialist growers should be able to supply you with the best straw for plaiting. This is an ideal wedding present as horseshoes were quite often given as presents to the bride and groom. Traditionally second wedding anniversary gifts have a theme of cotton and straw so a Corn Dolly can be given as an anniversary present. 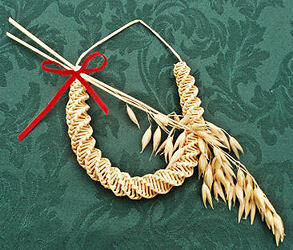 The core is often made using the straw from the lower part of the stem not used for plaiting. Insert the wire into a straw. Tie the straws together at the ends and middle using a Clove Hitch. Select five straws that will be used for plaiting and cut the heads off. Tie the straws to the core with the thick end of the straws trailing behind. Insert a bodkin into one of the straws that make up the core which you can hold to start off the plaiting. Spread the straws out so that they are at right angles to each other with two at the right hand (or left if you are left-handed). Take the lower of the right hand straws (straw marked a) and fold it anti-clockwise over the one above it (straw marked b). The straw needs to be kinked at the corner but not squashed. Bend the working straw over the straw by its side. If you follow the above method you will get sharp crisp folds which will enhance the plaiting. Hold that worked straw together with the one away from you while you ease your grip with the left hand and rotate the plait 90 degrees in a clockwise direction (in the direction of the arrow). Lower your left hand index finger on to the corner to stabilise it. Fold straw "c" over straw "a" using the "lift and bend" technique. Rotate the plait 90 degrees in a clockwise direction (in the direction of the arrow). Fold straw "d" over straw "c" using the "lift and bend" technique. Rotate the plait 90 degrees in a clockwise direction (in the direction of the arrow). Fold straw "e" over straw "d" using the "lift and bend" technique. Rotate the plait 90 degrees in a clockwise direction (in the direction of the arrow). Keep repeating steps 3 to 6 until you have reached the end of the core when it will be time to finish off your plaiting. Tip: The needle used at the start can be removed as soon as there is enough of the plait to hold firmly. Straw will gradually become thick and eventually finish or it may break and so you will need to add more straws. It weakens the plait if there is more than one join in a round so try to stagger the insertions. Tip: When you tie the straws to the core try to ensure that the straws are uneven in length as this will help to stagger the joins. To add a new straw trim the worker straw off where there would have been the next fold, insert the thinner end of the new straw into the old and continue. Cutting the straw as shown in the diagram will hide any join giving the impression of a seamless plait. When you reach the end of the wired core you will need to start closing up the spiral. To complete the plait bring the next worker straw under the fold of the opposite locked straw. Pull all straws tight. Trim the straws to within a half an inch (1.5 cm) of the folds. Do not trim the straws fully until the plait is completely dry. Tip: If the core has dried dampen the plait before you bend it into shape. Make the horseshoe shape. This can be done round a jar. Pin the horseshoe onto some thick card or a cork mat until it is dry to help retain its shape. 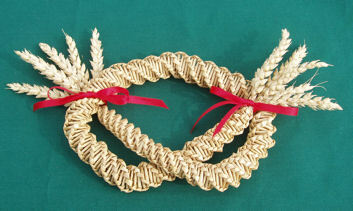 Decorate the horseshoe with ribbons, flowers or heads of wheat. Make a hanger out of ribbon or a 2 or 3 straw plait. Most of these Books will have a section on plaiting. This beautiful corn dolly was made using 6 straws rather than 5 giving it a tighter spiral.